Well, I’m back from my travels (actually got back on Thursday but it’s taken this long to get through the pile of washing and read about 1000 emails…). On the way to our destination, we came across a car boot sale. We spent about an hour and a half there examining all the treasures. And look what I got there! It only cost me Â£14. I looked it up on the internet and apparently it was made in Germany, not sure when. It’s got a transverse shuttle, whatever that is – it is a long, thin one anyway. 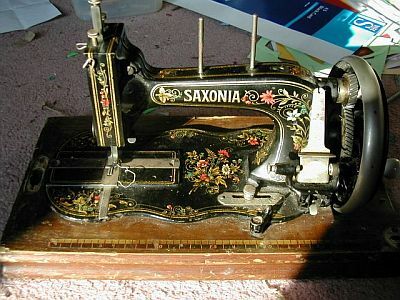 The start to my very own sewing machine museum! !